A Seed Cake 24 ounces of Butter beat to a cream, 24 ounces of white sugar beat fine, 24 ounces of flour will dried 12 Eggs leaving out the whites of 4, a few caraway seeds, if you like you can put almonds cut in peices the cake should be beat an hour & two hours to bake it in a moderate oven Portugal Cakes Two lb of Butter, two lb of sugar, nine yolks & 4 whites of Eggs, 2 lb of currants & a glass of Brandy. 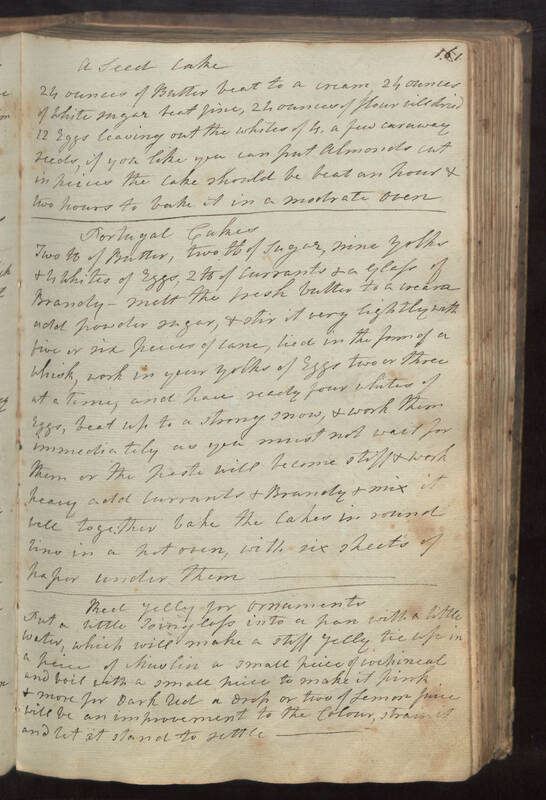 melt the fresh butter to a cream add powder sugar, & stir it very lightly with five or six peices of cane, lied in the form of a whisk, work in your yolks of Eggs two or three at a time, and have ready four whites of Eggs, beat up to a strong snow, & work them immediately as you must not wait for them or the paste will become stiff & work heavy add currants & Brandy & mix it well together bake the cakes in round tins in a hot oven, with six sheets of paper under them. Red Jelly for Ornaments Put a little Isinglass into a pan with a little water, which will make a stiff jelly tie up in a peice of muslin a small peice of cochineal and boil with a small peice to make it pink & more for Dark red a drop or two of Lemon juice will be an improvement to the Colour, strain it and let it stand to settle.